Born in 1948, Wykeham Gallery artist Mervyn Goode studied Landscape Architecture at the Gloucestershire College of Art, but left this profession at the age of 21 to pursue single-mindedly his vocation as a landscape painter. 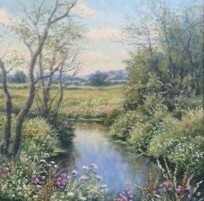 His first one-man exhibition in London in 1970 was a huge success and he has continued to exhibit in London, the provinces and the U.S.A. since that time, both in one-man and mixed shows, with unqualified success, so that his work is much sought after by his many collectors both in the UK and abroad. His work has been reproduced by the Medici Society, the Bucentaur Gallery, Royle Publications, Kingsmead Publications and the Southwell Brown Gallery; in numerous Fine Art books and periodicals; and has featured in various television documentary programmes. Mervyn Goode's rambling country home sits above his own woodland, with far-reaching views over the Hampshire "Hangers" countryside which features so often in his work. He is an artist for whom to live among and know intimately the nuances of his cherished corner of the countryside in all its moods and seasons is vital - this rapport providing the inspiration which he is dedicated to portraying on canvas. More recently he has acquired a sixteenth century cottage in the South Hams area of South Devon - an area with which he fell in love when he first visited it as a student over 25 years ago. His second home there has enabled him to experiment and to broaden the subject matter of his work, so that exhibitions are now including works depicting the South Hams landscape and estuaries.